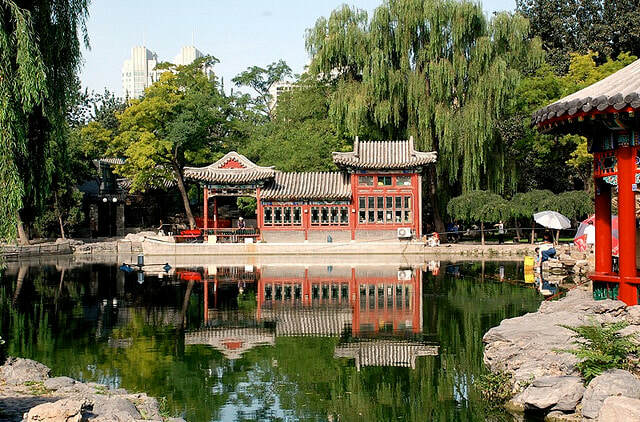 Originally built in 1530, Ritan is one of the five ancient altars in Beijing. Ritan Park offers numerous old buildings for sacrificing to explore and one ancient tree more than 1,000 years old. ​Ritan Park was open to the public in October 1969. It is ideal to get acquainted with the sacrifice etiquette of the emperors in the Ming (1368 - 1644) and Qing (1644 - 1912) Dynasties. Located to the southeast of Chaoyang Gate in Beijing, the Ritan has red doors. The doors are lined with golden ginseng, which is the same as other royal gardens in Beijing. The gates of the palaces, the temples and the royal houses in Beijing are not only decorative, but also embody the feudal hierarchy. The Ritan Altar is surrounded by walls in the four directions. It has not been open to the public. Outside the red wall, there is a warehouse where the tools for sacrificing were stored, and a musical instrument house. The park offers numerous spots to explore. The Zhaori altar is a layer of square stone made of white stone. The emperors must pass by this alter. Jufu Hall is located to the northwest corner of the Ritan altar. It is a square courtyard and was the place where the emperors took a rest and got changed. The southwest scenic area is a combination of the courtyards in south of the Yangtze River and the simple and elegant northern garden scenery. Visitors can also admire statues in the park. The best months to visit Ritan Park are from May to July and from September to October as many flowers are in blossom and the leaves on the tree turn yellow, which is ideal for photographing. There are several buses passing by the park. Therefore, there are several options. Visitors can take a break in one of the tea house or cafes in the park. Children can enjoy themselves at the amusement park in the park. Visitors can see many citizens do morning exercises in the park, such as dancing, Tai Chi and so on. Interested in visiting Ritan Park on a Tour? Wendy Wei Tours offers a variety of different packaged tours as well as custom tours including Ritan Park, among other attractions and destinations. To find out more, please visit our Tours page or Contact Us directly to find out more.